Learn the Common peroneal nerve decompression and application of NeuroCap device (Polyganics) surgical technique with step by step instructions on OrthOracle. Our e-learning platform contains high resolution images and a certified CME of the Common peroneal nerve decompression and application of NeuroCap device (Polyganics) surgical procedure. The superficial peroneal nerve is at risk during fasciotomy of the anterior and peroneal compartments of the lower leg. 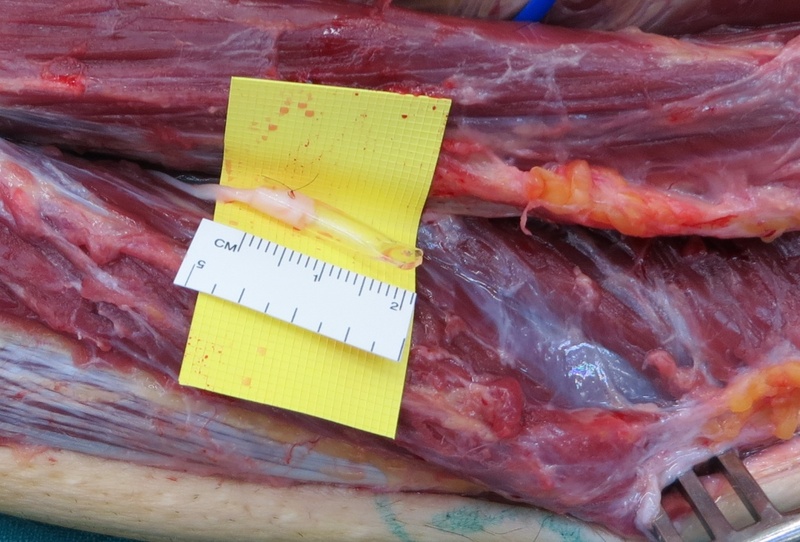 This patient sustained a complex lower limb blast injury and underwent fasciotomy surgery for compartment syndrome. The blast injury had resulted in direct trauma to the muscles within the anterior and peroneal compartments and an axonal injury (axonotmesis) to the common peroneal nerve (both the deep and superficial components). The sensory recovery in the deep peroneal cutaneous territory was good with patient reported sensation in the dorsum of the first web space at 6/10. There was anaesthesia (0/10) in the superficial peroneal territory on the dorsum of the foot, trophic changes with dry skin, small skin ulcers from repetitive trauma and severe neuropathic pain. The patient had a below knee amputation to the contralateral limb as a consequence of severe trauma from the blast injury. The pain in the residual affected limb was so severe that the patient was unable to stand. Any active contraction of the peronei, the tibialis anterior or the extensor digitorum longus would also provoke the pain. The patient had requested amputation of the affected right lower leg as a pain management intervention because he had become confined to a wheelchair for several years being unable to stand on the right leg to walk using the left below knee prosthesis. Diagnostic block of the peroneal nerve erradicated the pain for a few hours. A decision was made to explore for a superficial peroneal nerve neuroma and to undertake a neurolysis of the deep peroneal nerve from the distal peroneal tunnel through the scarred area past the site of Tinels’ sign. There is no satisfactory solution for painful neuromata. In a neuroma in continuity for a critical nerve sensory restoration through excision of the neuroma and nerve grafting may reduce neuroma pain. Restoration of pain to anaesthetic skin may modulate pain pathways centrally. Using a processed nerve allograft may confer advantages over autologous nerve grafting as the latter creates another sensory nerve injury (albeit a controlled surgical insult) to a nerve in a pre-sensitised individual. In many situations there is an end neuroma or the bed is too poor for grafting. Many operations have been described for end neuromata including repositioning the proximal end to deeper tissues with less scar including bone and muscle. Polyganics have developed a bio-resorbable nerve capping device (the NeuroCap) that is designed to cover the nerve end following neuroma resection. The device has a chamber for nerve regrowth but the nerve is prevented from adherence to scar by a physical barrier which slowly changes to a hydrogel and is ultimately completely resorbed over 18 months. The NeuroCap is made from a copolyester poly-lactide-caprolactone (PLCL).